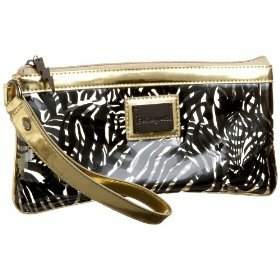 This Betseyville Safari Park wristlet is yet another bold and dramatic handbag from vivacious designer Betsy Johnson. This miniature wristlet definitely isn't for the shy and retiring amongst us! The glossy gold trim, the bold animal print and the clear on-trend vinyl all combine to make this a real attention grabber. As with many of the funky clear plastic handbags floating around the market, this wristlet does look a lot like a makeup bag. Cute, of course - but would you want your handbag to look as at home in the bathroom as in your hand? With its simple elegant lines and basic design, this zebra print clutch from Betsey Johnson does exactly what it says on the tin. It is affordable, cute and very fashionable, even if the concept is decidedly basic.